Mission Statement The Friends of Slide Rock State Park was formed to provide support to Slide Rock State Park. 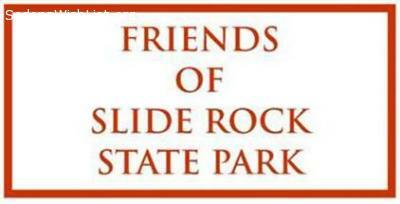 We are a non-profit 501 (c) (3) organization dedicated to protecting, preserving and promoting appreciation and enjoyment of the historical, ecological, scenic, recreational and cultural resources of Slide Rock State Park. The Friends of Slide Rock State Park all volunteer organization is dedicated to enhancing the visitor experience support the mission of Slide Rock State Park and maintains high standards in preserving the heritage of Oak Creek Canyon and Slide Rock State Park. 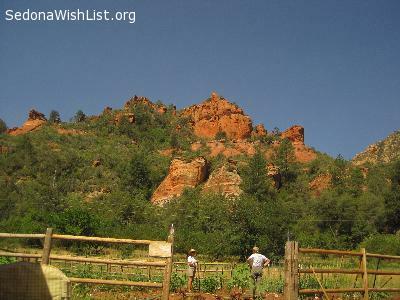 Services and Projects Volunteering at Slide Rock is a unique opportunity in a setting of the beautiful rock formations of Oak Creek Canyon, apple orchards, and historic buildings. 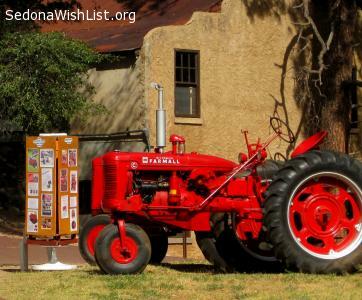 Our members/volunteers help with fundraising projects to help achieve our organizational goals, historical interpretation (docents), restoration, ecological stewardship, maintenance services to assist parks with maintenance and small construction projects. Thank you everyone for supporting and celebrating "Homecoming at the Homestead" at Fall Festival at Slide Rock State Park held Oct 4th. It was a great success. We wish to thank the National Forest Service, Smokey Bear, Oak Creek Watershed Council, Red Rock State Park volunteers, Slide Rock State Park Rangers and volunteers, Arizona State Parks, Verde Valley and Arizona Fly-wheelers, Dena Greenwood, Patty West, William Weathersby, Jack and Nikki Wilden, John and Vic Bacon, Gary Lewallen, Tony Norris, Kathy Pendley Shaw, the Arizona FFA leadership council, U of A Sigma Alpha Sorority, all our volunteer bakers, Verde Valley Railroad, Blazin' M Ranch, Pink Jeep Tours Sedona, Bearizona, The Arboretum at Flagstaff, Lowell Observatory and the Museum of Northern Arizona. Friends of Slide Rock State Park 501 (c) (3) a non-profit organization. Our mission is to protect, preserve and promote the historical, ecological, scenic, and cultural resources of Slide Rock State Park. We're asking for donations of gift cards toward supplies for putting on the Fall Festival at Slide Rock State Park Oct 4, 2014. You can help support us with gift cards from Bashas, Natural Grocers, Whole Foods, Office Max, Fry's, Safeway, or Home depot. 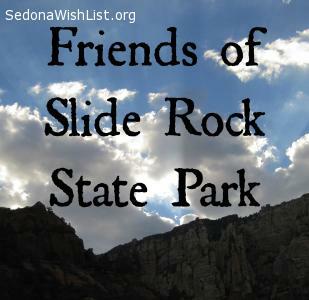 Thank you for mailing your gift of support to Friends of Slide Rock P. O. Box 3432 more information at https://facebook.com/friendsofsliderock Thank you! The Friends of Slide Rock State Park wish to thank the Sedona Springs Resort for the generous donation and delivery of 2 tables complete with chairs and umbrellas for our volunteers who work tirelessly in the Pendley Memorial Demonstration Garden in Slide Rock State Park. We are grateful to have received 8 folding chairs recently donated. We could use up to 25 more, for future presentations/events in the 1932 apple packing shed at the park put on by our volunteer group. Thank you from your Friends of Slide Rock State Park. Friends of Slide Rock State Park volunteers could really use 15- 20 folding chairs and a projector for lap-top power point presentations. We are a non-profit 501 (c) (3) organization dedicated to protecting, preserving and promoting, appreciation and enjoyment of the historical, ecological, scenic & recreation of SRSP. We are very thankful to Rita Bond at Sedona Chamber of Commerce for donation of a lap-top computer. The Friends group of Slide Rock State Park could really use 15- 20 folding chairs and a projector for lap-top power point presentations. We are very thankful to Rita Bond at Sedona Chamber of Commerce for donation of a lap-top computer. still urgently needs a projector and laptop computer for PowerPoint talks and demonstrations as well as 30 folding chairs, a headset microphone and speakers before their Fall Festival on September 21. Please help. It will be getting warmer soon..and our volunteers have been working very hard working in the demonstration garden in the park. They do so much for us, We would love to have a shady spot for them. We are in need of a nice outdoor umbrella picnic table for them. Also *40 folding chairs, *4-6 Folding tables, *3 radiant heaters and *3 cooling fans. We plan to present monthly talks in the 1932 Apple Packing Barn. Our gifts could be new but we would be just as happy with recycled and gently used too:Computer lap top, screen, projector for power point talks and movies. Headset microphone, speakers, 40 folding chairs, podium, laser pointer, radiant heater, fans, 6 folding tables, 4 shovels, 2 rakes, 2 hoes, 200 feet of horse fencing, 25 T posts, landscape cloth, heirloom seeds, well rotted horse manure delivered, pressure treated post and rail fencing or Gift Cards towards items.